Sometimes when vacuuming you may find that you run out of reach because of the length of the cord or hose, with this Dewalt wet/dry vacuum, that is not much of a problem since you can switch from AC power to DC power and continue vacuuming using it as a cordless vac. 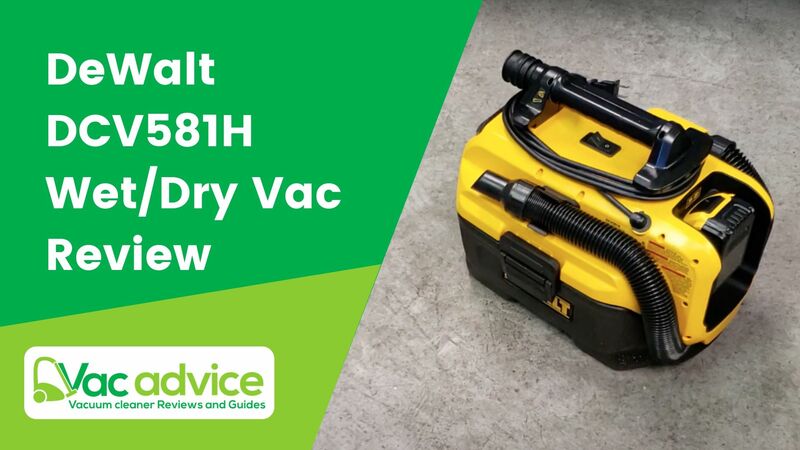 Personally, it sometimes is confusing whether to have a cordless or a corded vacuum so instead of spending on both of them, I would gladly have one that gives you a bit of both as this DEWALT DCV581H review will show. This is for the home or car owner who would like a handheld vac that has powerful suction and offers cordless operation. People like me who would like to have a bit of both worlds will probably appreciate this vacuum. The DEWALT DCV581H has the option of running it on a battery, either 18 or 20 volts which can produce up to 20 minutes of power. I find that if I am vacuuming and I get to a point where the cord cannot reach, I can unplug the cord and switch to battery power. This also comes in handy when there may be no electricity but you need to attend to a mess urgently. The filter traps 99.97 percent of dust which makes this vac fit to use for fine dust like drywall dust since it will not blow particles into the air like some vacuums do. The filter is also easy to maintain as it is washable and reusable and DEWALT provides replacements though with the right care, you may not need one for a long time. The provision for accessory and hose storage on this vac is very neat, unlike some other vacuums. The hose slips into a groove on the back of the unit and then winds upward where its head locks perfectly on the body while the cord wraps around the base of the top handle, this makes transporting the vacuum easy especially for a handyman who may have many other tools to carry. The cord wrapping also prevents it from getting into the way when you are using batteries. The handle of the DEWALT is thick and comfortable, this ensures a firm grip as you use it or transport it, this also balances the weight of the vacuum so that it does not become a burden as you use it. The base of the vacuum is flat and wide so that it can sit steadily on the ground and not tip over, I guess it also helps that it is shaped like a box, which lowers the center of gravity. This hose is made to take punishment and still come out unscratched. I have had to replace a number of hose because the car run over them or because after constant use they get spoilt but DEWALT says they have made a crush resistant hose so you do not have to worry that it may get spoilt as a result of wear and tear. At least that is one thing less to worry about replacing. ​Q. In the picture, I do not see other tools, what tools does it come with. ​Q. Do you have to use only DEWALT batteries? ​Q. What is the suction power like? 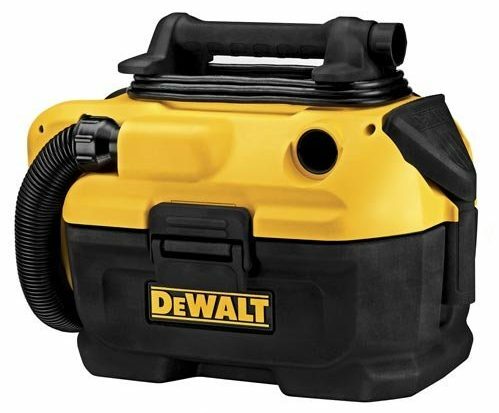 If you are thinking of purchasing this Dewalt vacuum, the main things you should remember are the fact that it can be used as a corded r cordless vacuum so for a quick cleanup, you will not need to search for a socket and if you run out of cord length, you can always switch to cordless operation. The portable design of this vacuum makes it easy to carry around in your car. I also think it is a vac you can take for outdoor activity like camping after all you never know when you may need to vacuum.